Rustic bridal shower invitation features string lights hanging on the tree branch and cute little mason jars with pink roses and baby&#;s breath blossoms. The hand painted mason jar in the center has a cute love heart and couple&#;s initials on it. Other mason jars holds only white baby&#;s breaths. 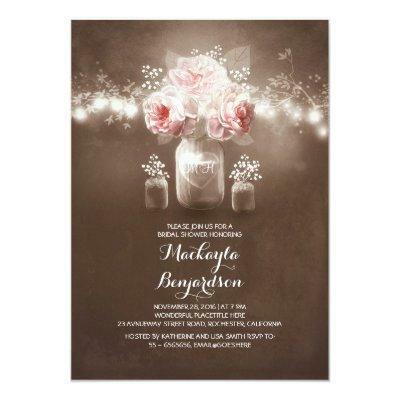 Perfect invite for for rustic country bridal shower with pink flowers. Cute and whimsical invitation for outdoor bridal shower with twinkle lights, fireflies and floral mason jars.